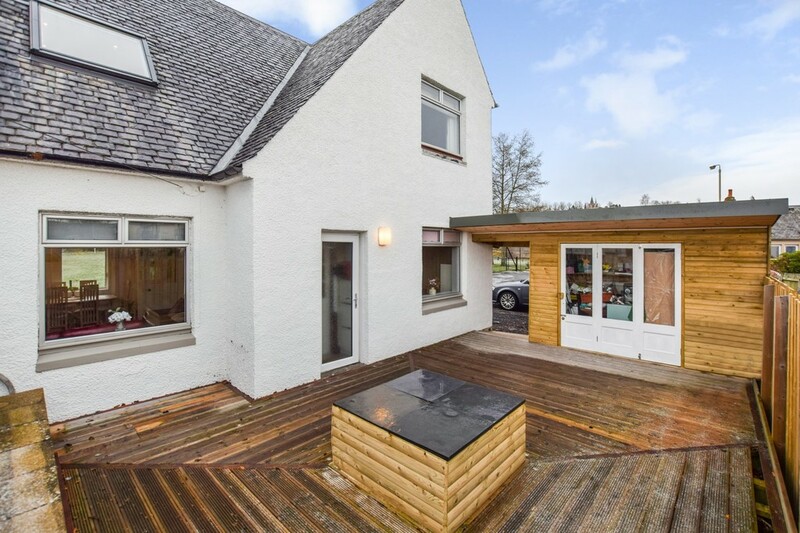 A rare opportunity to purchase this deceptively spacious and immaculately presented 3 BEDROOM SEMI DETACHED FAMILY VILLA which is quietly tucked away at the end of a residential cul de sac within a highly desirable area of Crieff. 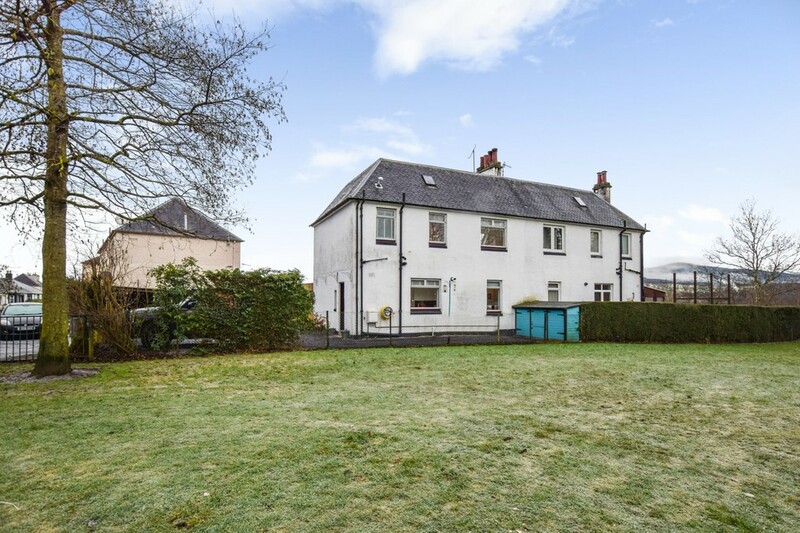 The property offers well proportioned accommodation over two floors comprising: entrance vestibule, hall, lounge/dining room, modern kitchen, W.C., rear hall and bedroom 3 on the ground floor level together with two further double bedrooms and a modern bathroom on the first floor. There is double glazing and gas central heating throughout and the property benefits from having under floor heating within the bathroom. EPC RATING D.
The property has been modernised to a very high standard and has many additional features including lighting within the floor and ceiling areas, fitted wardrobes with excellent storage facilities with concealed mirror and vanity drawers, wood burning stove in the lounge/dining area together with an enclosed decking area and fire pit within the garden. 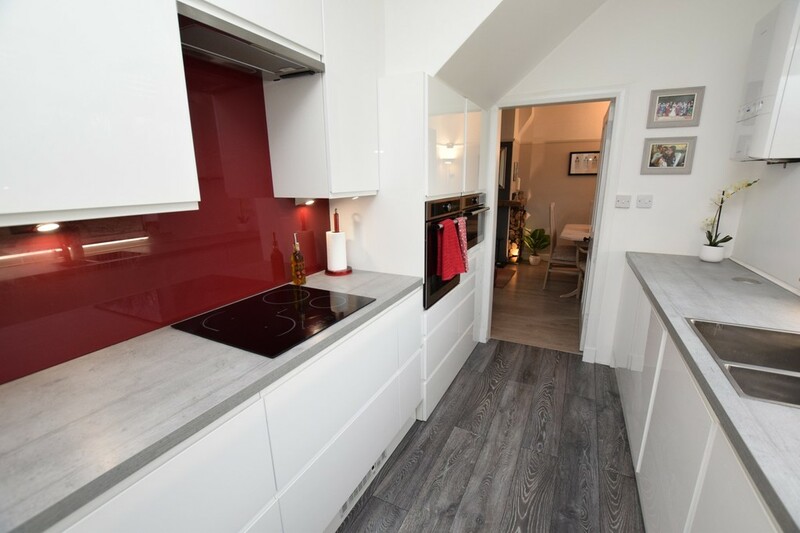 These are just some of the many attractive features that the property has to offer and early viewing is highly recommended to appreciate the quality and quantity of accommodation available. AREA The vibrant town of Crieff offers a wide range of shops and visitor attractions including Crieff Visitor Centre and Glenturret Distillery. 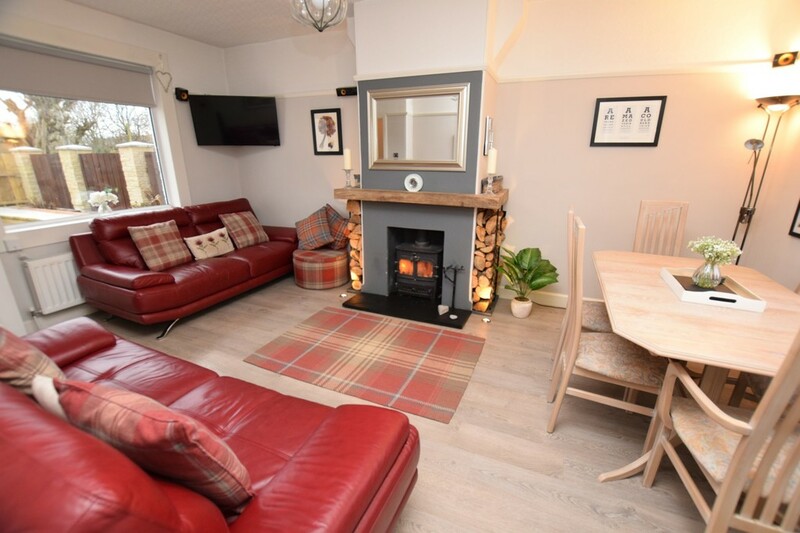 Crieff is positioned on the edge of the Scottish Highlands therefore the beautiful countryside can be found not far away from the town centre. There are primary and secondary schools within the town including the reputable Morrisons Academy and public transport is regular and close to hand. ENTRANCE VESTIBULE 4' 4" x 1' 8" (1.32m x 0.51m) An opaque glazed front door from the decking area gives access to the vestibule where there is a handy storage cupboard. 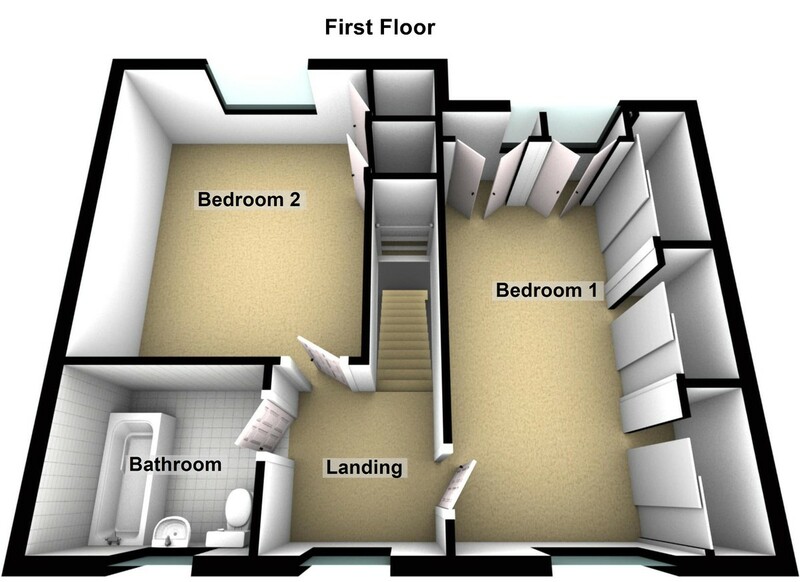 HALLWAY 5' 1" x 4' 10" (1.55m x 1.47m) The hall provides access to all accommodation and has laminate floor covering. LOUNGE/DINING ROOM 17' 5" x 11' 6" (5.31m x 3.51m) A very bright and spacious public room entered from both the hall and the kitchen via partially glazed doors. 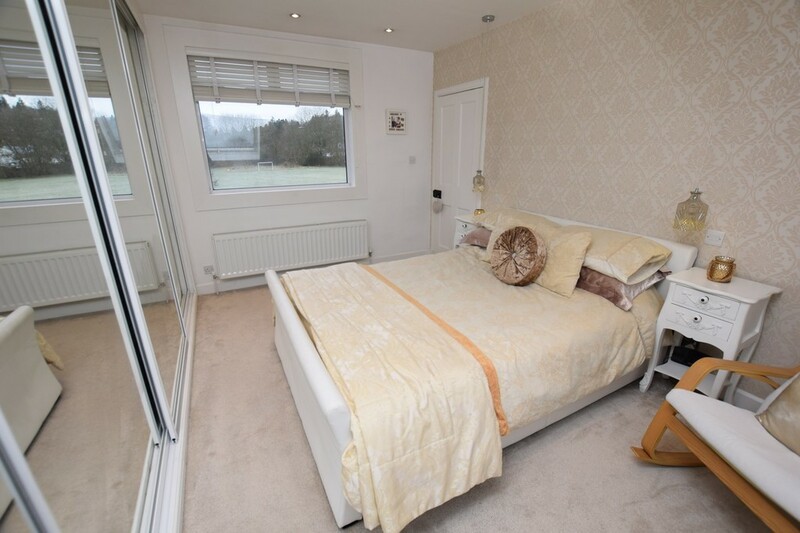 This bright room has dual aspect windows to the front and rear and has lovely views overlooking the park. 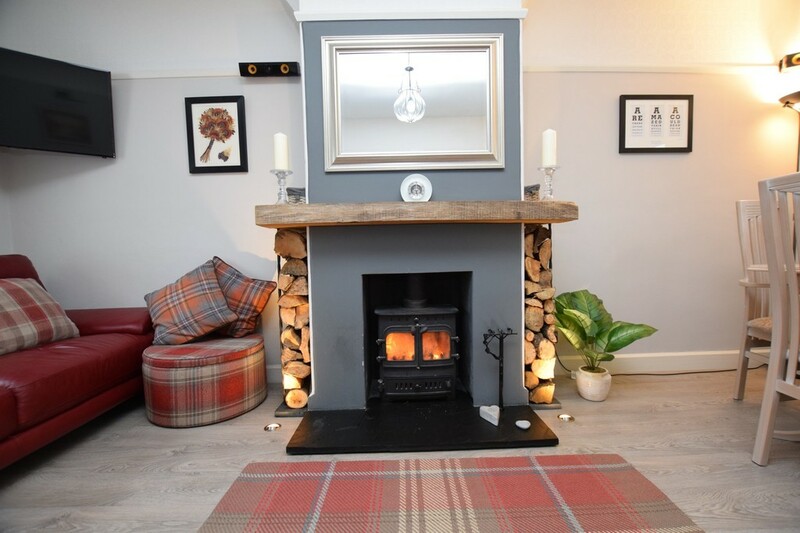 Attractive feature fireplace with wood burning stove and adjacent floor lighting. Radiator. Telephone point. Laminate floor covering. 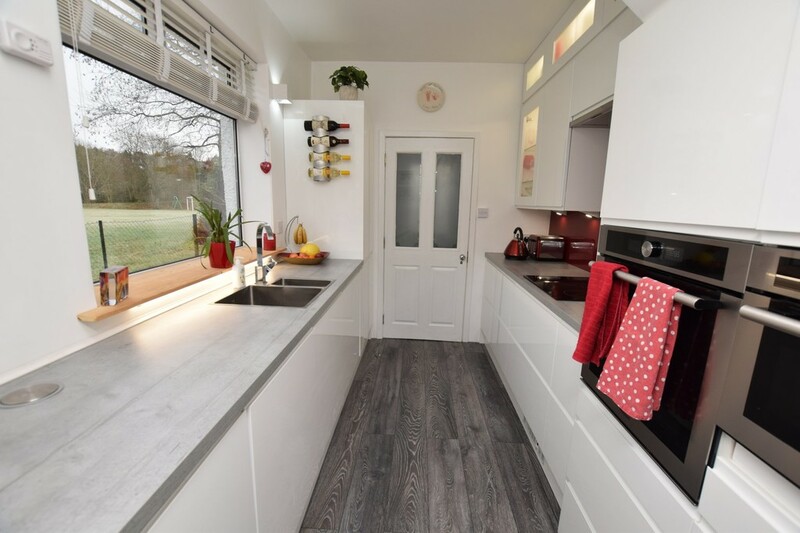 KITCHEN 11' 0" x 7' 6" (3.35m x 2.29m) Fitted with a range of modern wall and base units in high gloss white including deep pan drawer units and glazed display units with lighting. Integrated oven, combination oven and induction hob with extractor over. Integrated fridge/freezer. Stainless steel sink with mixer tap over. Concealed socket tower within the work station. Fan heater. Window to the rear, again affording lovely views over the parklands. Laminate floor covering. W.C. 2' 11" x 1' 1" (0.89m x 0.33m) Fitted with a modern white suite comprising: W.C. with concealed cisterna and wash hand basin. Partial wet wall to the walls and tiling to the remaining walls. Chrome ladder towel rail. 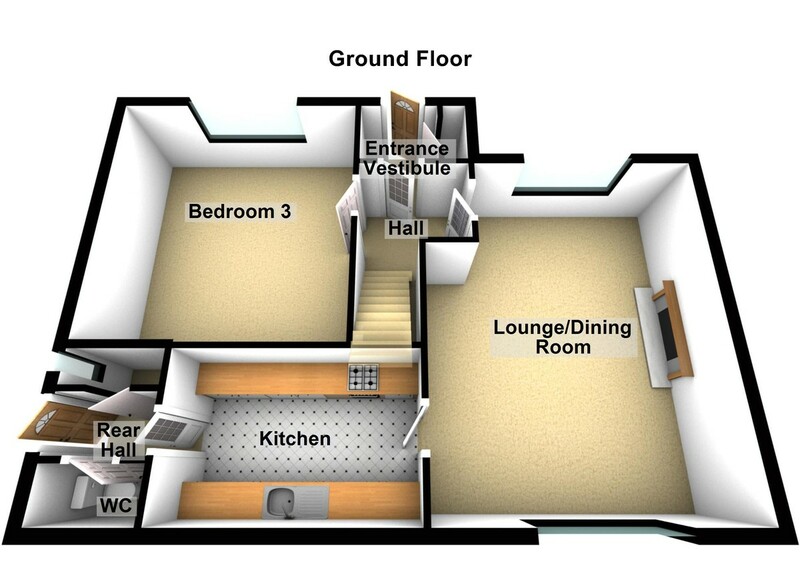 BEDROOM 3 12' 0" x 10' 7" (3.66m x 3.23m) A spacious and versatile room which would make an excellent third bedroom if required. Window to the front. Radiator. Carpet. LANDING 7' 3" x 6' 6" (2.21m x 1.98m) A staircase with carpet runner provides access to the first floor landing. Window to the rear. Hatch providing access to the attic space. 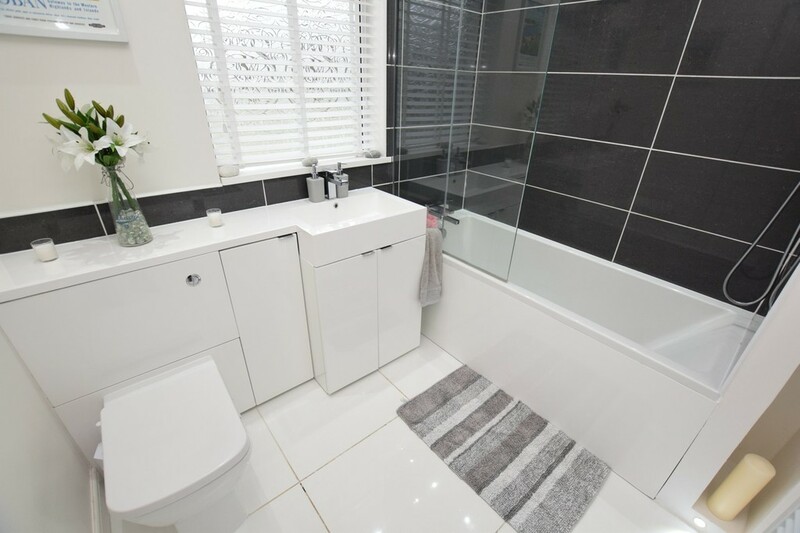 BATHROOM 7' 7" x 6' 4" (2.31m x 1.93m) Fitted with a modern white suite comprising: W.C. with concealed cistern and wash hand basin enclosed in vanity unit with cupboard under and bath with rain shower over and glazed screen. There is also a separate additional shower head attachment. Inset lighting to the ceiling and at the floor level. Recessed alcove with display shelving. Tiling to the walls and complementary tiling to the floor. Ladder chrome heated towel rail. An opaque glazed window to the rear provides additional light and ventilation. Under floor heating. BEDROOM 1 15' 5" x 9' 3" (4.7m x 2.82m) A very spacious and bright double bedroom with Velux window to the rear and additional large picture window to the front. Fitted wall to wall wardrobes finished with mirrored sliding doors and incorporating hanging rails and shelving with concealed pull out mirror. 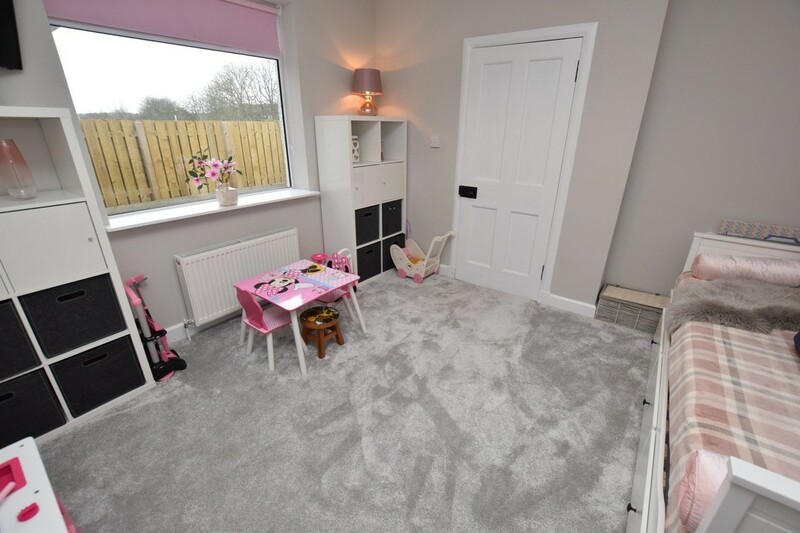 There are also several power points within the wardrobe for the use of a hair dryer or concealed TV and additional storage by way of pull out hanging baskets. 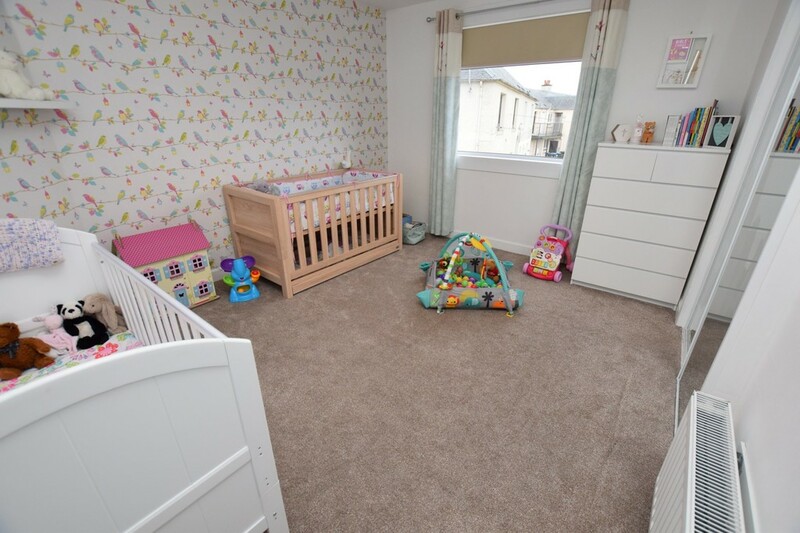 Further storage is available in the room with floor level drawer units and cupboards. Inset lighting to the ceiling. BEDROOM 2 13' 5" x 11' 6" (4.09m x 3.51m) A further double bedroom with window to the front. Double fitted wardrobe with mirrored sliding doors, shelving, hanging rail and lighting within. Radiator. EXTERNAL The property is situated at the end of a quiet cul de sac and has the benefit of overlooking the parklands to the rear. There is a large driveway providing ample off street parking which is gravel chipped for ease of maintenance. Carport. External timber log stores. 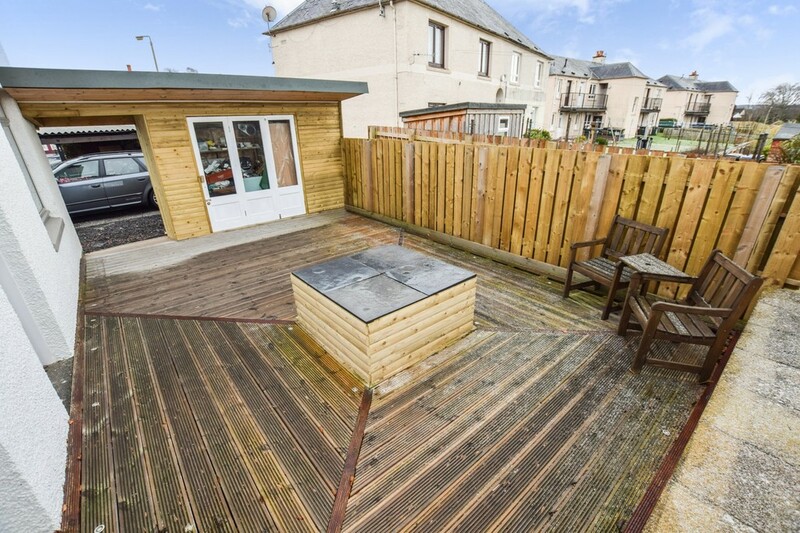 Shed To the side of the property leading to the main front door there is an attractive area of decking with lighting and a recently added shed which is entered via glazed doors and has the benefit of power and light. Within the decking area there is a fire pit and raised bedding planters. Externally there are also a number of power points and there are hot and cold taps. FINANCIAL SERIVCES Next Home Mortgages offers a range of mortgage, financial and insurance services. Unlike the Banks we are available 7 days a week! Call us now on 01738 45 90 69. LEGAL SERVICES In association with Next Home, Next Law are a dynamic, forward thinking law firm providing a range of legal services to clients from offices based throughout Perthshire. Next Law = Modern thinking, traditional values.